Boven rechts: Billy Rose Theatre Division, The New York Public Library. Ed Latimer. A student of psychology In Philadelphia, a Master of Arts on the stage on tour with Broadway productions, and a juvenile and light comedian with John B. Mack "Century Players" Mr. Latimer had some very practical ideas about "audience psychology", a subject in which he was intensely interested and one with which he said every actor should be familiar. The study and practice of "character" makeup's he considers a delight, and be spends much time on it when necessary. He also did spend time to be the deputy of the 100 per cent Equity company in Lynn. Began his theatrical climb at the Little Theater, Philadelphia in a repertoire of Shaw, Galsworthy, Chekov, Ibsen,.... And at 18, received the only laudatory poem review of the entire company for his Dr. Rank in "A Doll's House". To add to his income Ed took on a daytime job. The two jobs dovetailed neatly in an A to Z pattern. At night in the theatre he played roles ranging from juveniles to aged, bearded grandfathers; during the day he completed the A to Z pattern—working as a typist. With a good foundation secure after two years in the city of his birth. Lewis A Gordon engaged him for one of their acts, which played the Orphean Circuit an entire season. While on the Coast Mr. Latimer played with Mae Murrey in Danger, Go Slow. The next season came a transcontinental tour in It Pays To Advertise, in which be enacted Ambrose Peale. Then followed stock, with the Mae Desmond Players, Philadelphia; the Majestic Players, London, Canada; stock In Hamilton, Canada. and a tour thru the Dominion in Charley's Aunt, and a season with the Francess McGrath Players. Paterson, N.J., which led to his engagement with the Permanent Players, Winnipeg, in 1923. “Ed Latimer, Jr., in a character role, was well made up, but his voice showed the strain of imitation of an elderly man" (1926). In 1930 he was taking leads in musical stock companies in the burlesque and regular circuit in New York. Specializing in straights, heavies and narrations in the 30s (since 1937?) he already had an impressive list of radio shows in which he had appeared: Mrs.Wiggs of the Cabbage Patch, Just Plain Bill, David Harum, Mr. Keen Tracer of Missing Persons, Alias Jimmy Valentine (with Bert Lytell), Gang Busters, Society Girl, Columbia Workshop, Americans at Work, Arch Oboler's Plays to name a few. In August 1932 he also appeared as Sloppy in Broadway play called The Devil's Little Game. But his theater experience was far greater than this one credit seems to imply. One report in 1941 boasted Ed played 2,327 performances of Abie's Irish Rose on the legitimate stage. 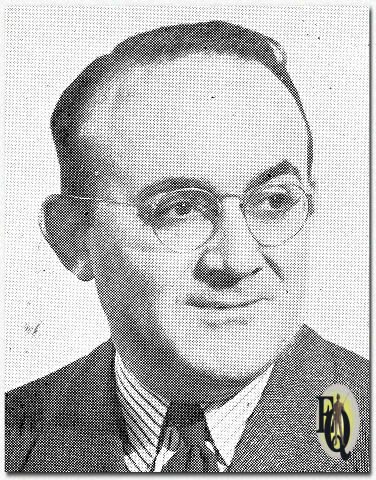 Ed Latimer became program director of WBNF, and in 1937 directed the WPA Federal Theater Radio Division's oldest series, Pioneers of Science then in its second year over WHN. In 1941 he was presented with two season passes for the 77th session of Congress. Not only did this imply studying New York-to-Washington train schedules. He also loved to ride on those "roller-coaster" cars that swish around under government buildings to facilitate legislative transportation. Above right: In Rosemary Ed Latimer played Mr. Dennis (1945). He also played in radio's Brownstone Theater (1945) opposite Gertrude Warner and Jackson Beck. Dual roles on the same broadcast have brought painful experiences to many a performer, but few can match the strange assignment of character actor Ed Latimer, who murdered himself in a Nick Carter (1945) sequence then -according to the script- went to the electric chair for his crime. 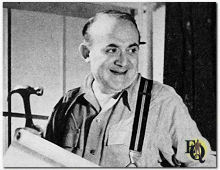 In The Romance of Helen Trent, a daytime radio institution, Bugsy O'Toole (Ed Latimer) played Gil's general handyman. It was during the war, in the course of Gil's confidential government work, that the two became friendly. Bugsy is a rough but likeable person, and is very devoted to Gil. (1946) (Picture below left) . Gil (David Gothard) lives with Helen (Julie Stevens) in a charming white house in San Fernando Valley, not far from Hollywood, they're being served by Bugsy (Ed Latimer) (Picture below right, 1949). With the rough exterior and, under it, the sweetness of a child and the devotion of a man who would lay down his life for his friend the role fit Ed Latimer to perfection. 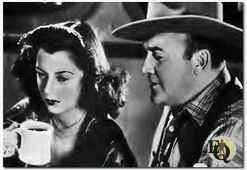 Above left: In Helen Trent, Bugsy O'Toole (Ed Latimer) as general handyman (1946). 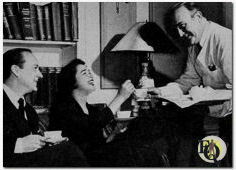 Above right: Gil (David Gothard) and Helen (Julie Stevens) are being served by Bugsy (Ed Latimer) (1949). Ed Latimer started rewriting and selling news stories into radio mysteries. In 1947 he boasted never to have gotten a reject. He also played the smalltime gangster George Terry, on the CBS serial Young Dr. Malone (Feb 1947). In 1947 he played Sergeant Velie on The Adventures of Ellery Queen. On TV Ed Latimer is most famous for his roles in The Clock (1949), a Suspense/Anthology series based on a ABC radio series which ran from 1946-48 and Robert Montgomery Presents (1950). The Doctor’s Wife was a 15 minute, Monday thru Friday continuing series, broadcast on NBC radio during the 1950s. It featured Patricia Wheel as Julie Palmer and Donald Curtis as Dr. Dan Palmer. Ed Latimer was Frank Johnson (1953). Not much is known as to when exactly or how Ed passed away. 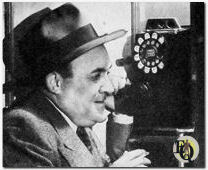 In 1956 he did appear on the July 13. broadcast of CBS radio workshop and died later that year. He was buried in Hawthorne, Westchester County, New York. This actor profile is a part of the Ellery Queen a website on deduction. The actor above played Velie in the 1947 radio series of The Adventures of Ellery Queen.